Some time ago, I watched “The Bucket List with Morgan Freeman and Jack Nicholson, and was inspired to create a list of things that I’d like to achieve, see, and do, before I kick the bucket. 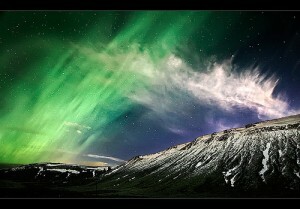 One such thing is to see, and photograph the Aurora Borealis, otherwise known as the Northern Lights. There is something enchanting about these radiant dancing lights in the sky. Look at stunning images like the one below by Orvaratli, and read how to photograph this natural wonder here.